ASU Art Museum exhibits Rivera painting as another work breaks auction record. Last week, a painting by Mexican artist Diego Rivera sold for $9.76 million, making it the highest-priced Latin American artwork ever to be sold at auction. The sale of the painting “The Rivals” eclipsed the previous record for a Latin American work, a painting by Frida KahloKahlo's "Two Nudes in the Forest” sold for $8 million in 2016., Rivera’s wife. The Rivera work, which hung in the home of the late philanthropist David Rockefeller, was sold to an unidentified collector and it’s unclear whether it will ever be shown in public. But people who want to appreciate Rivera’s other work can do so right here at Arizona State University. The ASU Art Museum has two pieces by the artist — the painting “Niña Parada” from 1937 and a lithograph of a self-portrait from 1930. Both are part of the current exhibit, “Bajo Presíon/Under Pressure,” which runs through Aug. 11. “Niña Parada” is part of the original collection gift that formed the museum from Oliver B. James, who also donated works by Georgia O’Keeffe and Edward Hopper. Miki Garcia, the new director of the ASU Art Museum, said the Rivera works are part of an incredible permanent collection of Mexican art ranging from the late 1800s to the present day, including the three “greats” of the postrevolutionary era: Rivera, José Clemente Orozco and David Álfaro Siqueiros. Garcia said that “Niña Parada,” an image of a little girl painted in bold colors, is symbolic of Rivera’s work at the time. “It is representative of Rivera’s real interest in highlighting the indigenous past and present of Mexico. One of the things he did was help establish a national identity after the revolution, embracing its indigenous heritage as well as its Spanish one,” she said. The painting in the Rockefeller sale, “The Rivals,” was commissioned by Abby Aldrich Rockefeller in 1931 and given as a wedding gift to her son David and his wife. The painting, which depicts a colorful scene, hung in the Rockefeller home in Maine. “While ours is a solo figure and that one is a group of figures, it’s definitely the same visual language — the costumes, the formal treatment of the figures,” she said. Rivera is one of the most important Mexican artists of the 20th century, famous in his time for his large public murals, which celebrated a new view of history for a largely illiterate population. “They are didactic — these narrative stories for the country to learn about their own history and their own place in the world,” Garcia said. The self-portrait lithograph in the ASU Art Museum, which is from 1930, is unsparing in its depiction. “He did, throughout his life, do self-portraits in an unflinching way. He was a man who was obese and corpulent and really didn’t finesse that in any way,” she said. Garcia said that self-scrutiny came from his popularity and his subject matter. While he painted the vibrantly beautiful little girl in the ASU collection and is famous for his calla lily works, his topics were subjugation, colonization and genocide. “All of the artists of that time were Marxists, dealing with the trauma of postrevolutionary Mexico and dealing with being the neighbor of the U.S. during the industrial revolution and thinking about the worker and exploitation,” she said. Rivera had a tumultuous relationship with Kahlo, whose own work was influenced by Spanish-American folk art and traditions. She has always been popular in Mexico and, increasingly, in the United States, especially since the Chicano-American civil rights movement, Garcia said. “I would say she is probably the more popular but in terms of art history, Rivera is still considered the master,” she said. Garcia said the high price for “The Rivals” is likely due to two factors: Few Rivera works come onto the market; and this one was part of the celebrated Rockefeller collection, which sold for a total $833 million in the three-day sale in New York last week. Besides the Rivera works, the “Bajo Presíon/Under Pressure” exhibit of early and mid-20th century Mexican art also includes works by Siqueiros, Leopoldo Méndez and Rufino Tamayo, among others. The ASU Art Museum has a new partnership with the Los Angeles County Museum of Art that will include a fellowship to increase the diversity of museum leadership but also will include exchanges of artifacts. Psychology is the study of human behavior, but not all psychologists directly study people. 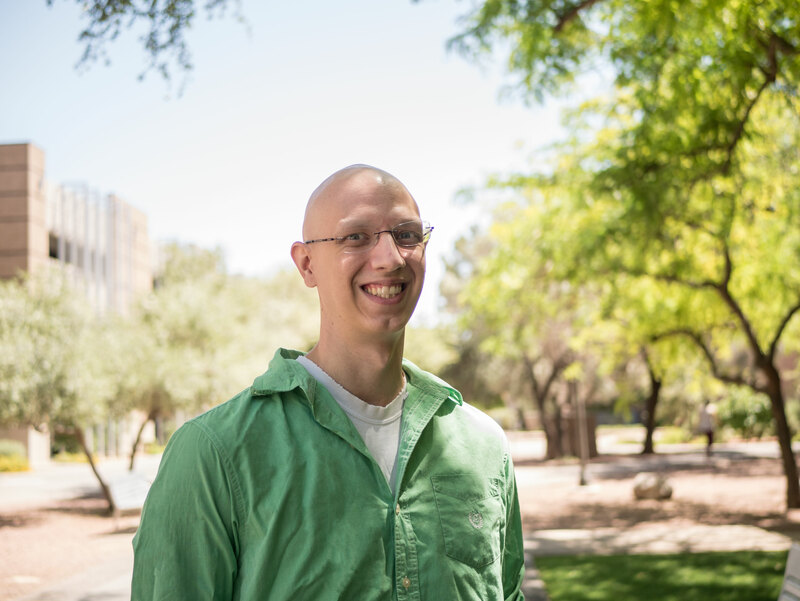 Some psychologists like Daniel McNeish, a new assistant professor in the Department of Psychology at Arizona State University, figure out the best ways for scientists to understand their data. Psychologists analyze their data using statistics, and most statistical methods assume there is a large dataset. To test which statistical methods work well with small datasets, McNeish creates simulated data, which he calls “his imaginary friends.” He creates a new small dataset and, because he knows what the answer is from the start, he can figure out which ways of analyzing the data are the most accurate. Some of his recent findings were published in the flagship journal of quantitative psychology, Multivariate Behavioral Research, and this paper was the most-read article in the journal during 2016. McNeish is also interested in how findings from small datasets are interpreted. In a recently published article in Educational Researcher, he investigated how well standardized test scores, such as those used for college admission, predict performance compared to testing data acquired throughout a student’s education. Using publicly available testing data of test scores from kindergarten through eighth grade, McNeish and his collaborator indeed were able to better predict student performance. McNeish, who hails from Massachusetts, started his undergraduate studies at Oakland University in Michigan. He quickly realized that he enjoyed studying both math and psychology, so he asked his first-year statistics instructor for advice on how to choose between the two disciplines. Soon after moving to Connecticut, McNeish started studying with Steven Stemler, associate professor of psychology at Wesleyan University. McNeish would go to Stemler’s office, and Stemler would ask what he wanted to learn about that day. They delved into topics such as item response theory and structural equation modeling as McNeish earned his undergraduate degree in psychology. Next, McNeish moved to the University of Maryland to pursue graduate studies in statistics. At Maryland, McNeish earned his master’s and doctoral degrees through the department of behavioral statistics. He worked as an assistant professor at Utrecht University in the Netherlands and as a research scientist at the University of North Carolina before joining the psychology department at ASU.